Despite being human-disturbed habitats, powerline cuts can be great places to botanize. Because of the sandy, sunny nature of the site, this 1.5 mile stretch of powerline heading north from E. King Road to Ithaca College includes some species more typical of coastal plain communities, such as Asclepias tuberosa (butterflyweed), Cirsium pumilum (dwarf thistle), Gaylussacia baccata (black huckleberry), Rosa carolina, as well as a variety of Vaccinium species (blueberries). The margins of the service road running uphill from the parking lot have some interesting plants, including Verbena hastata(blue vervain), Anaphalis margaritacea (pearly everlasting) and Pycnanthemum tenuifolium (narrow-leaved mountain mint). We may also see other species in flower, such as Lespedeza violacea, Polygala sanguinea, Pseudognaphalium obtusifolium, Spiranthes cernua(? ), goldenrods and asters. Meet at the Cooperative Extension Parking Lot (Willow Ave.) at 9:30 to carpool to the site. We went above Ithaca College, past the water tower on the Observatoy Access Road, and to the nearby powerline cut. We had good weather, although a bit cloudy so fewer butterflies were out. 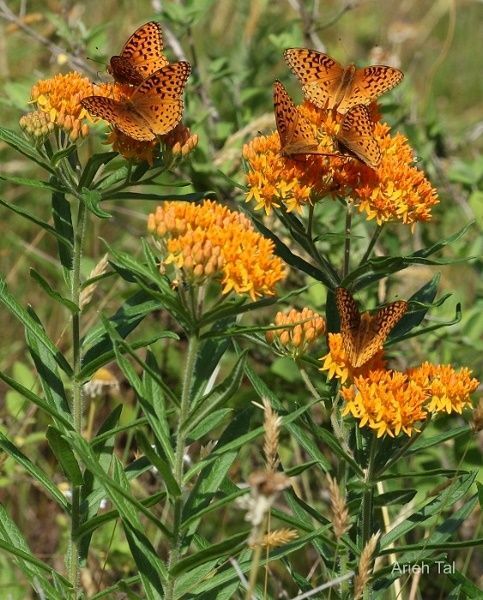 But the butterfly weed was in full bloom - wonderful - and the native thistle was intermixed. An interesting spot at this time of year. The access road described above had been mowed during the preceding week, so we missed a couple of species, but the list is still pretty long!